Discover how "Profit Motives" and "Politics" are Endangering "Your Health", "Your Life" and Preventing "POTENTIAL CURES" from ever coming to fruition. ... If you have ANY "Hope" or "Desire" of EVER being "CURED"! You will have to take matters Into YOUR OWN HANDS And "STOP" Waiting for people who Profit from YOUR PAIN and SUFFERING to bring that PAIN and SUFFERING to an end. Are YOU tired of Kidney Failure Robbing you of your Health, Freedom, Future and Peace of Mind? When in fact, many of these excesses have nothing to do with our quality or quantity of life. However, many of these commonly accepted industry concepts, practices and procedures have everything to do with making rich people richer to our detriment. Is this the way you want to spend what ever time you have left? I Have Been On Dialysis For Over 10 Years. And I have personally experienced and witnessed many suspicious activities carried out by Dialysis Corporations that were not carried out for the benefit of patients. I have interviewed patients, patient's families and current and former employees of this industry who share my suspicions. ... As a result, I have concluded that a movement to make a cure for Kidney Failure a reality is absolutely necessary in order to bring the pain and suffering of millions of Dialysis Patient to an end! I am living proof that much of what the dialysis industry orders for its patients is not absolutley necessary to improve or sustain their lives. Because for over 8 years now, I have refused many of the excesses that the people who control this industry, and those who work for it, have repeatedly tried to impose upon me in spite of my relative level of good health, which I achieved without these excesses! I'm proud of the level of health that I have been able to maintain in spite of my illness and the way that this industry "TREATS IT" -- but I'm not telling you all of this to brag. I'm telling you this because I want you to be motivated to work for higher levels of health, a better quality of life, genuine care and concern for patients, (as opposed to just higher profits) by this industry, and ultimately a cure. Even though I know, that this is a "Paradigm Shift" the Dialysis Industry deliberately works hard to prevent its patients from envisioning. ... they have "NO REAL CLUE" about the "TRUE NATURE" of the industry that they work for. So they unconsciously respond to their intensive training by inflicting many of these excesses on patients over and over again, under the cover of "Our Good Health", in order to keep their paychecks coming in. And... I've got real, concrete proof that the primary objective of this industry is not to provide individualized treatments to patients that benefit the patient (as an individual), but to duplicate the same practices (in excess), for all patients to maximize profits, even if these things are not necessary or beneficial to the patients. And, they continue to do these things because they can, and because doing so maximizes their profits. I have seen far too many questionable incidents occur within this industry that have not always added up to being "What Is Best for the Patients". Of course, these are not observations that a " Totally Compliant Patient" would be capable of making. Only observant, analytical and inquisitive patients who cannot be successfully indoctrinated by this industry would be able to detect these inconsistencies. I have witnessed the abuse of many patients who were subjected to excessive drug prescriptions, unnecessary and excessive surgeries, extremely long and painful treatments that their bodies obviously could not tolerate, and other medical excesses that did not enhance the lives of the patients who were forced to accept these abuses-but that actually (in far too many cases), made an already painful and debilitating situation even worse. And as long as the companies responsible can continue to bill the insurance companies and The Government for these excesses, no one cares about how devastating the effects are to human beings who are already sick, in pain and suffering from a disease that (in and of itself), is devastating enough, without these additional physical and psychological stressors. I was experiencing many things that seemed to be doing me more harm than good at my center, but I couldn't put my finger on the problem until after I talked with Greg. It all became so clear after I shared my feelings with someone who could relate... Why the lack of response to my questions about feeling so bad during and after treatments, why no one seemed to care or even try to answer my questions about what I was going through. Greg told me all of the things that I was experiencing before I could tell him. He also told me why these things were happening and why they would most likely continue to happen. He also recommended steps that I could take in an attempt to correct these extremely negative conditions at my center. As a final corrective measure, he recommended that I change centers. Now things are not perfect at this new center, (which he also warned me about), due to what the industry and the government consider to be acceptabe practices, but things are somewhat better at the new center. I was new to dialysis and really scared. I was told that I had a right to be. I spoke to Greg on the telephone about my fears and concerns. And when I finally became deeply immersed in the process, it was still frightening and unsettling. But it was as if, I already had a blueprint for each and everything that was going to be said, done, recommended, attempted or ordered for me. I also knew how to effectively respond to the actions of the dialysis center staff, and to make sure that the things that they recommended, (and that I accepted), were the best possible choices for me. I left in-center dialysis for home dialysis. Boy! Was I surprised about the negativity that I experienced when I had to return to my original center. I was on in-center dialysis for over 3 years, when I finally found a willing home dialysis partner and started doing home dialysis. However, because of a change in this person's life, I had to return to my original center in less than a year. When I returned, not only did the in-center dialysis make me extremely ill, but I was subjected to so much negativity by many of the staff members at this center, (who treated me like making the decision to start home dialysis and leave "Their Center", was not mines to make). After learning that one of my previous caretakers was Greg's Sister and that he too was a dialysis patient- I asked for his contact information and spoke with his patient advocate and him, and was quite surprised at how casual and unsurprised they were about what I was experiencing as a result of leaving and returning to this center. They told me that this was typical behavior for that particular center and that I should at the very least, change to another center immediately, and at the most, get the dialysis partner situation straight and return to home dialysis ASAP, utilizing another company. I have met many dialysis patients who always complain about what they are subjected to as patients. But, Greg is the first one that I met who has decided to do more than just complain. In spite of the fact that many dialysis companies like to put people in advertisements that seem to be so very happy that they have been afflicted with such a painful and debilitating disease as kidney failure; the fact of the matter is that the vast majority of patients who have to suffer through all of these necessary or unnecessary and excessive painful, life threatning experiences, do not like or happily accept kidney failure as such a great thing to have. Most dialysis patients are unhappy and misirable as a result of this disease. And they complain, moan, groan and in some cases, violently object to the things that are being done to them. Greg is the first patient that I have met who wants to do more about his suffering and the suffering of others who have been afflicted with End Stage Renal Disease, than just complain. He wants to find a permanent soulution to the problem. And of course, I and every other dialysis patient who wants to be cured should be cheering him on. I have observed many highly suspicious incidents involving the "High Pressure Salesman" of this industry since becoming a dialysis patient. And I have noticed that their "Sales Pitches" go from the "Sublime" to the "Ridiculous", based on how bad they want to make that sale at that particular time. 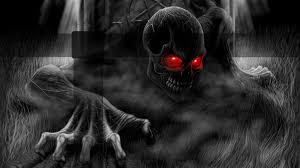 At every center where I have been treated, (current center included), every month their seems to be some kind of serious and possibly deadly lab value that requires immediate, and or drastic medical intervention. These immediate actions may include an increase in the dosage of existing medications, additional access surgeries, or additional prescriptions in addition to the many that the patient may already be taking. Now of course, this is not to imply that each and everytime something is ordered for a patient it is not "Medically Necessary". The dangerous lab value had either improved or had completely reversed itself, without the proposed drastic measures that were recommended! And most of the time, the lab values that they were overly concerned with did not present any apparent or immediate dangers or threats to my life. It is also important to note that in most cases, these "Dangerous Lab Values" did not even present any uncomfortable or debilitating symptoms. The only evidence of danger was in their words. And the really frightening thing is that the proposed medical interventions would have created severe side effects or irreversible damage, had I not decided to evaluate my own medical condition and assess the risks that I was, or was not willing to accept based on their recommendations; or in many cases, their threats, intimidation or demands. Once you do, you will find that the only permanent solution to our problem is "A CURE", which those patients who want it bad enough must be willing and able to work, study and fight for. And the constant unbearable fear of living the rest of my life this way and of dying before ever having my freedom, my health and my life back again. But since I made a conscious decision to spend the rest of my life, energy, creativity, strength and power, researching, advocating and fighting for a cure-And for reforming this industry to benefit patients instead of the profits of corporations; I feel much more hopeful about the future, and empowered as a "Pro-Active Dialysis Patient", than I could ever feel as a "Sacrificial Lamb" who is at the mercy of "Greedy Corporations" and "Powerful Medical Entities". You too, would have discovered (as I did), that there is "Absolutely No Scientific Reason" that adequately explanes why we are nowhere near a cure for Kidney Failure yet, with the existence of all of these foundations,associations and organizations, supposedly dedicated to the irradicaiton of this disease. I have also noticed that in this country, Many Cures Are Deliberately Suppressed; not because the technologies to create them are not available, or because of concerns over safety and efficacy. This suppression is the result of the many dark and powerful entities that are being rewarded financially for protecting the profits of major corporations, such as those that administer the treatments for End Stage Renal Failure Patients, the Pharmaceutical Corporations that provide the Standard Panel of Dialysis Drugs to this industry, and the many other support industries that profit as well, because thousands of people remain ill until they die. I had to learn these deep dark secrets through costly "trial and error" both in money, time and risks to my health, sanity and my life. I've done the groundwork for you! And as a result, you're about to learn why it is possible for us to change the way that the current dialysis industry treats its patients, and why we as Kidney Failure Patients "Together", can bring currently suppressed cures out of hiding and put them where they can minimize and finally eliminate all of these thouands of people's pain, suffering and anguish! Am I saying that these accomplishments will be easy? Or that they will happen overnight? There is NO magic formula for taking on and defeating establishments that have been allowed to operate with impunity for as long as the dialysis industry has. But what I am saying is-that having your Health, Freedom and Life back, is a worthy goal that makes this a movement worth being a part of, if you are currently suffering as a Kidney Failure Patient, or if somebody that you love is. ... Notice that I left out "Patience". Of course, patience will also be required to make these positive changes a reality. ... If you or someone you love is currently suffering from Kidney Failure, you already know The Answer!" I'm just so SICK and TIRED of seeing patients being taken advantage of by the so-called "Healthcare Industry", which is really just a "Massive Profit Generating Conglomerate" used by Dialysis Corporations and other medical entities to the detriment of people who are already suffering, just so these companies can continue to maximize already significant profits. My strategies are based on the fact that I too, am suffering as a result of being a Pro-Active Dialysis Patient who demands the right to decide how my body is treated --and I have to fight this fight constantly, over and over again -- Which really does not seem to be something that people who have my best interest at heart would force me to do. And better still, the most important reasons for becoming involved in this movement are to protect your freedom, your health and your life! Whether you are the patient or the loved one of a patient, the knowledge in this book can prevent or minimize the damage that is routinely inflicted on dialysis patients all in the name of "Good Health", when in reality, much of what is done to patients is done in excess for the purpose of maximizing industry profits, no matter how much permanent damage or mutilation these excesses may cause to patients. ... and how you can become an active participant in this movement to cure Kidney Failure in the next five minutes!" 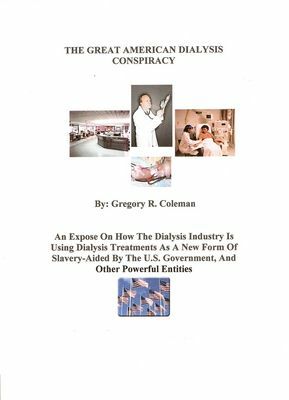 Once you download your copy of my exclusive eBook, which I've entitled "The Great American Dialysis Conspiracy", (Creating The Movement To Cure Kidney Failure),You Can Use the knowledge in this book to create your own group starting Online, starting right now. You'll discover EXACTLY what you need to do to get started on working towards a cure right away! I show you in detail EXACTLY how each of these STEPS will allow you to join the movement to CURE KIDNEY FAILURE once and for all. That means; No More Unplesant Treatments, No More Repetitive Painful Access Surgeries, No More Passing Out Or Going Into Convulsions Due To Over Treatments, No More Toxic Pharmaceuticals And Their Severe Side Effects-step-by-step plans to follow that will help set you FREE! .... And you’ll also learn the #1 most powerful element needed to succesfully realize the ultimate goal of this movement, which is to affect a cure for all patients who want to put an end to their pain and suffering FOREVER! I'm interested in working with people who are committed to success! So if you're serious about becoming free from the medical prison created by this disease and the industry that is responsible for treating it, then I want to work with you, for both your sake and mine. It helps the cause for finding a cure for kidney failure more when I work with people who are serious about wanting a cure for themselves, other patients or for loved ones... because the more successful this book is, the more people I can reach with the message that I am trying to share with the world about the plight of End Stage Renal Failure Patients in this and other countries. And that's why I've decided to put a very reasonable price of just $10 on this eBook. It's enough to prove to me that you're serious about making a cure for yourself and others possible -- And to cover the cost of promoting this eBook. I think that's a fair trade. "Three additional Super Bonuses are yours FREE, just for trying my strategies!" But just to sweeten the pot, I've ALSO decided to include Nine more very powerful FREE super bonuses that will give you the motivation and a firm foundation of knowledge that will prevent you from easily being deceived by the people who control and work in this industry. This report discusses treatment options for maintaining your level of health, so you can maintain a high level of activity in spite of this disease. Some people in the dialysis industry like to paint a pretty picture of dialysis. But there's nothing pretty about it. More information about the constant dangers that we face as a result of being on dialysis. Free Article: In Dialysis, Life-Saving Care at Great Risk and Cost -This report features a fracton of the dialysis horror stories that occur in America on a daily basis. Ten reasons why you should join the fight to protect your rights, your freedom, your health and fignt for a cure. What does the law say about Medical Negligence? Learn all that you can. You may need this knowledge one day. Social Networking is a powerful tool for communicating with other Dialysis Patients. Start with Twitter. Facebook is the largest social network in history. Use it to create public awarness about the Plight of Dialysis Patients in America. Free Article: What Is YouTube? How To Use It. Learn How To Use YouTube To Produce & Promote Videos That Help Create The Pro-Active Dialysis Patient Movement. Now that you know something about some of the Major Social Networking Sites; it's time to develop appropriate content to post on them. Start writing content today. Putting It All Together. Now learn how to link all of your information together on all of the Social Networks for maximum reach and impact. "You literally have NOTHING to lose when you try these strategies!" If you take this first step and claim your copy of "The Great American Dialysis Conspiracy", (Creating The Movement To Cure Kidney Failure), just let me know if you don't think that this is a humane and worthwhile goal. I will INSTANTLY send you an immediate refund... 30 days from today. "Become part of the movement to cure kidney failure in the next five minutes..."
If you don't, good luck with whatever it is that you choose to do. But if you're serious about having your disease cured while you still have the strength and the will to fight, then you really only have one choice. Invest the $10 to get a look at some knowledge that just might set you free. You've literally got NOTHING to lose. ... the longer you wait, the longer you will be constrained by this disease and controlled by corporations that are only interested in you to the degree that they can profit from your disease. Kidney Failure is a disease that has risen to epidemic proportions and is continuing to do so as we speak. That means that there are, and will be so many of us suffering, that if we all pull our resources, ideas, efforts and desires for good health together, I know that we can bring about a Cure for Kidney Failure, that will end this make the Suffering for thousands, if not millions of people. Remember: If you're not thrilled with my concepts and strategies, just let me know within the next 30 days, pay nothing and keep the free articles -- that's a guaranteed gain no matter what you decide. You'll receive instructions for downloading your eBook, directly to your email inbox, in the next five minutes. P.S. If you truly don't want to remain sick for the rest of your life, then You must create the conditions that make A Cure For End Stage Renal Disease Possible. However, if you want to be free from this need to spend a large portion of your life connected to a machine just to remain alive, or if you do not want to be transplanted with another human being's organ, (living but most likely dead), then no one is going to do this for you. There are people who are willing to do these things with you, but you have to do your part. Don't get me wrong, even with all of the frauds and scam artists out there, (many who do not care what they do to people as long as it is profitable); there are people who are working in earnest on cures for End Stage Renal Failure who are being blocked by those who have much to lose as a result this cure. Those of us who are serious about being cured must let the world know that we are serious, and that we are devoting our entire lives to having it. But simply put, no one person can reform the dialysis industry into an industry that works for patients instead of against them for profits. Neither can one person make a cure for this disease a reality. However, if you join a Massive Movement that has a CURE FOR KIDNEY FAILURE at the very heart of its existence; then you will most likely achieve this goal along with the other members involved in this movement. This is what "The Great American Dialysis Conspiracy", (Creating The Movement To Cure Kidney Failure) is all about. Do You Want A Cure For Kidney Failure? Come join the movement today!